Twitter announced yesterday that they now have more than 145 million registered users. That’s a lot, but how much is Twitter actually being used? Turns out that there’s more activity on Twitter than ever before, and it keeps increasing. 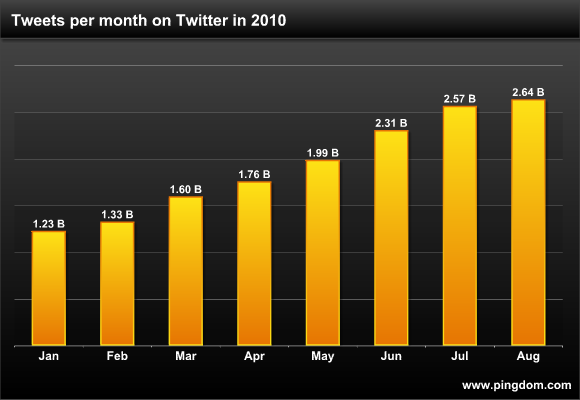 Twitter processed 2.64 billion tweets this August, an increase of 33% over May. Not a bad increase over just a summer. In August, an average of 85 million tweets passed through Twitter every day. And if you look at the whole year so far, the increase is even more impressive. Activity on Twitter has already more than doubled this year (August had 115% more tweets than January). Note that the above chart shows the total activity on Twitter, both Twitter.com and tweets sent via Twitter’s API, i.e. from all Twitter apps. Last year was a breakout year for the service, and that trend seems to continue. It’s a luxury problem, but this rapid growth of course puts a lot of strain in Twitter’s infrastructure (they’ve had their hands full). No wonder Twitter is moving into its own custom data center this fall. About the data: If you’re curious how we calculated the number of tweets per month, check out this post, the methodology is listed at the bottom.